As you may have seen in my previous blog posts, I completely adore Assassin’s Creed video games and most of all the third game in the series. 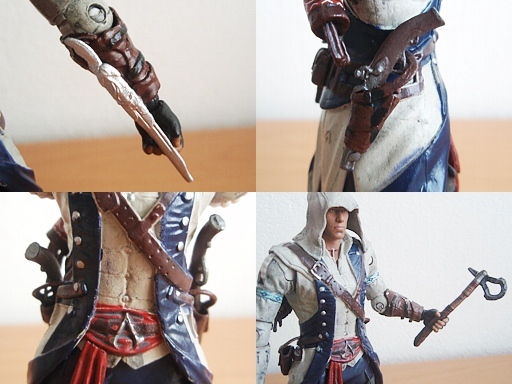 Not long ago I have bought this Assassin’s Creed Connor action figure, so I decided to write up a little review. 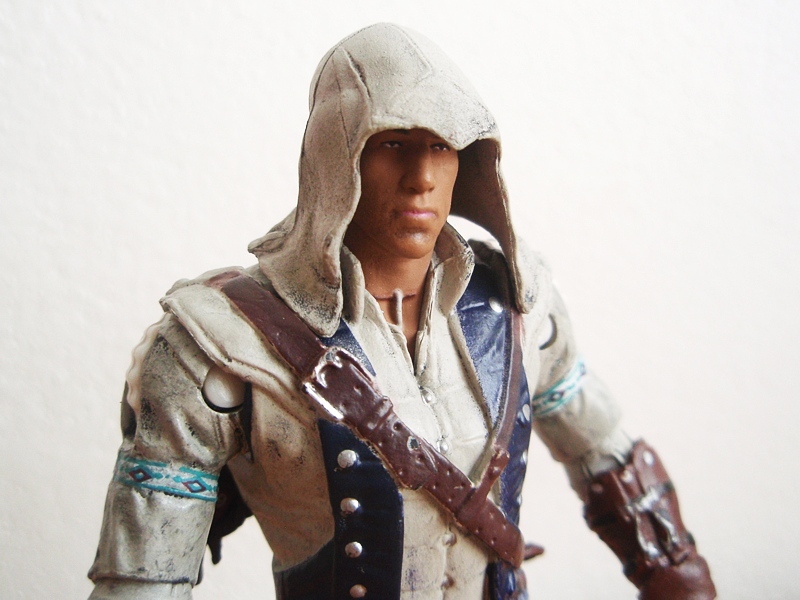 Connor comes in a sturdy plastic blister packaging including the weapons and the unique code. On first glance, the figure is really well made and easily recognizable due to his iconic clothing. 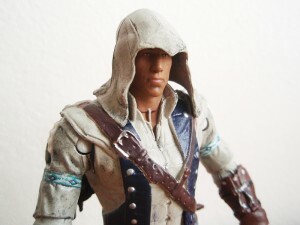 Upon closer inspection, his face doesn’t quite resemble Connor if you look from the front. His profile is pretty close to the real thing though. The paint job is good, there is no bleeding and it’s not sloppy. I like that they made his coat weathered to reflect the nature of his work and environment. At first the joints were kind of stiff to move but I guess that is normal for a brand new figure. He has 12 joints (shoulders, elbows, wrists, thighs, knees and ankles). The arms and hands are easy to pose and move but his legs are a bit limited in their movement due to his coat. The legs have limited forward/backward motion, there is a little rotating motion of the thigh but not much. The knees and ankles are easy to pose and have much wider range of movement than the thighs. The head moves just barely but that’s because of the hood. The hood cannot be pulled back and is attached to his head. 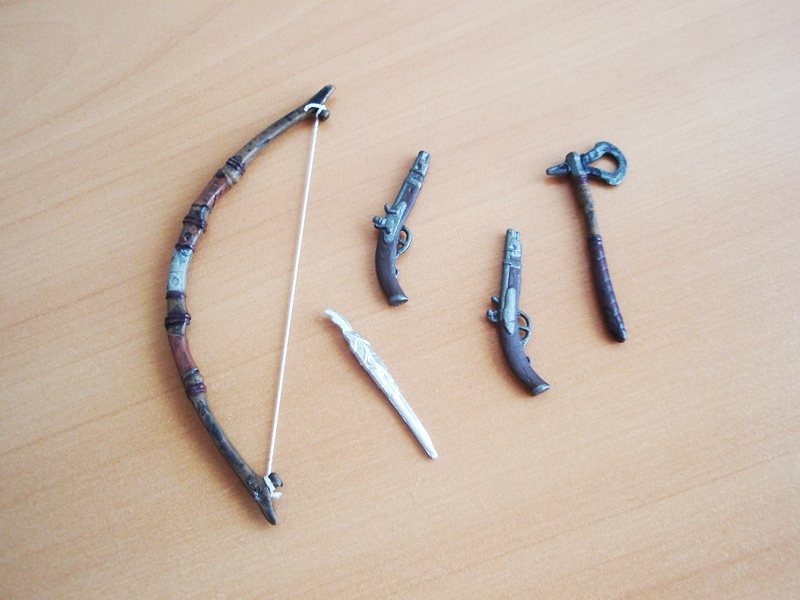 The weapons are well made, although one pistols seems thinner than the other one. The bow comes with thin elastic string, which makes it easy to drape across his torso. 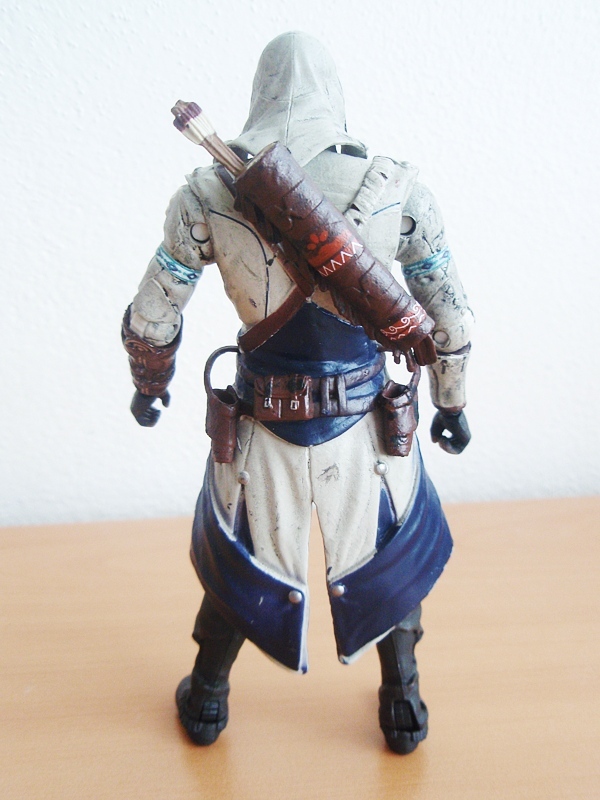 The Connor action figure has two holsters. Due to the fact that one pistol is thicker than the other, it does not slide easily to either holster. In fact, I broke off one of the holsters but thankfully it can be fixed quite simply as there are premade slots which I can glue it to. hand, I have to use a bit of force and even then he’s just grasping at the very end of it. His left hand doesn’t have this issue as the hole is sufficient and the thumb is separate from the fingers. My next issue is the hidden blade. It can be attached to his left forearm (cannot be tucked in like in the game), although it barely stays put and with the slightest movement of the hand it just pops off. I don’t like to have it attached to the figure because it limits the motion range of his wrist and is too finicky about staying put. I could glue it on but I rather prefer no to include it. 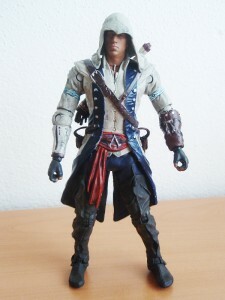 Despite the flaws (which could’ve just been on my action figure), I do recommend this Assassin’s Creed Connor action figure. If you are a fan of the character and the franchise, it’s a great piece to show off on your shelf. 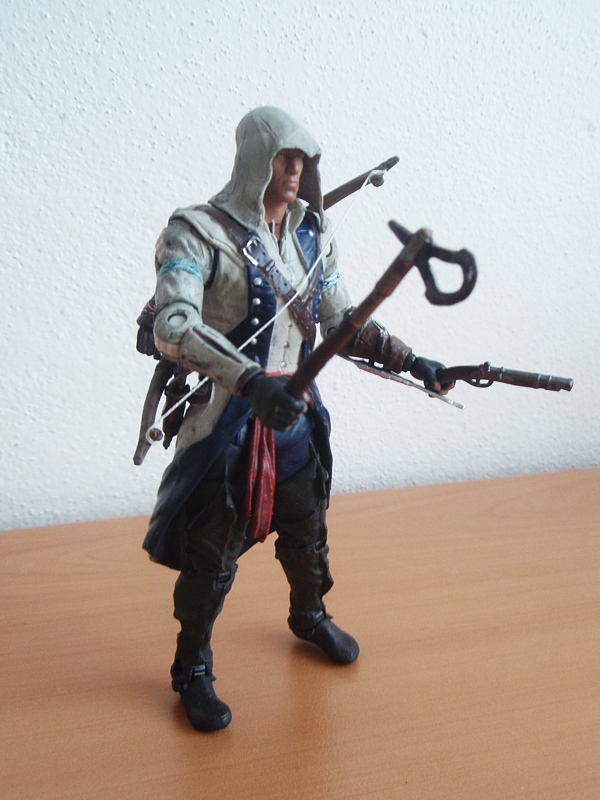 I’ll be definitely expanding my Kenway collection with Haytham Kenway action figure and also Ratonhnhaké:ton action figure from the DLC and Connor with a mohawk. How to Create Your Own T-Shirt Online? Easy!